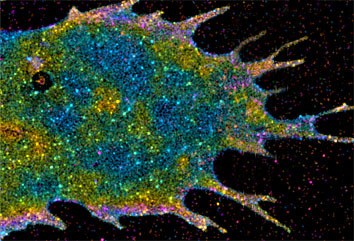 The shapes of some of the tiniest cellular structures are coming into sharper focus at the Howard Hughes Medical Institute’s Janelia Farm Research Campus, where scientists have developed a new imaging technology that produces the best three-dimensional resolution ever seen with an optical microscope. With this new tool, scientists can pinpoint fluorescent labels in their images to within 10-20 nanometers – about ten times the size of an average protein – in all three dimensions. The researchers say they now have an extremely powerful technology that will help reveal how biomolecules organize themselves into the structures and signaling complexes that drive cellular functions. Their new method adds a third dimension to a cutting-edge form of light microscopy that scientists at Janelia Farm have used for the last two years to create two-dimensional images that pinpoint the location of fluorescently labeled proteins with extremely high resolution. To push this form of microscopy to the next level -- three-dimensional imaging -- the researchers borrowed a strategy widely used in industry to measure vanishingly small distances, such as the subtle variations in height on the surface of a computer chip. “This will be a good tool to really untangle things right down to the molecular structure level,” said Hess, who led the development of the new technology in the applied physics and instrumentation group at Janelia Farm. Hess and collaborators at the National Institutes of Health, Florida State University, and Janelia Farm, who call their new tool interferometric photoactivated localization microscopy (iPALM), have already created detailed images of three-dimensional structures previously not resolvable with light microscopy. Their “photo gallery” includes images of the microtubules that give cells structure; the two layers of a cell’s outer membrane; and the focal adhesions that attach cells to their environment. Some of these images are included in a research article published in the February 2, 2009, issue of the Proceedings of the National Academy of Sciences describing the new technique. Hess and Janelia Farm colleague Eric Betzig invented the PALM microscope in 2005. Scarcely three years later, it was one of a handful of new methods of “super-resolution” microscopy that were honored by Nature Methods in January 2009 as the “Method of the Year” for the previous year. Hess and Janelia Farm colleague Gleb Shtengel saw a way around the problem: They decided to split each particle of light emitted from the fluorescent molecule in two. By splitting the photons, the researchers knew that each fluorescent photon would act as its own reference beam. They adapted the standard PALM microscope to collect this light both above and below the sample. Both of those beams of light travel to a custom-made beam-splitter, which divides the beam and sends it to three different cameras. A molecule’s depth within the sample determines how much light reaches each of the cameras. “We record an image triplet, and depending on how much appears in camera one, two and three, we can say ‘this was the height.’ This is by far the most sensitive way of measuring vertical height,” Hess said. “iPALM needs only a modest amount of light to generate its sensitive measurements, and that’s important for biological imaging,” Hess says. Imaging techniques that demand more photons can force researchers to label the proteins they want to see with brighter dyes – which are often bulky and require harsh sample preparations that damage cells. Fluorescent probes such as those compatible with iPALM, on the other hand, can be genetically encoded so that they are manufactured by cells themselves. The power of these glowing markers was recognized with the 2008 Nobel Prize in Chemistry, which was awarded to the HHMI investigator Roger Y. Tsien, Osamu Shimomura, and Martin Chalfie for the discovery and development of the first such tool, green fluorescent protein.